Genesis Software develops affordable software that can help meet the needs and expectations of our customers .A trial version of any of our software can be downloaded at any time, giving you the opportunity to try the product for free. You can rest assured that our programs are exhaustively tested for viruses and spyware, and rechecked on major download sites like Download.com and Simtel, as well as many sites that simply check software to make sure that they are suitable for customers. Please take a look at our software and remember you don't pay unless you are satisfied with the product. Do you want to review your knowledge of English, mathematics, science, geography, and history? Are you interested in designing tests in the field of your choice? If you answered yes to any of the above, then Academia 3.0 can help you to achieve these goals. Version 3.0 is the successor to Academia 2.1, and it boasts new and updated features, including the Test Creation Wizard, a custom dictionary, and Books Central, which is a reference tool that covers many topics in the five subjects. The quizzes tests your knowledge of topics covered in high-school courses, and the level of difficulty even extend to college courses. Learning has never been so much fun, especially as all the quizzes are in multiple-choice format. Academia 3.0 has been updated with the most current and accurate information in the study material, which has been referenced and cross-referenced, so you should feel confident that the program will meet and hopefully exceed your expectations. Academia 3.0 is also available on Cnet.com. Simply click the button below to view and download. Many people wish that they could memorize and recall information instantly. 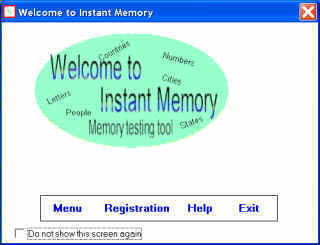 Instant Memory 2.0 is a program that allows you to quickly study letters, words, and numbers and then tests your ability to recall the information that you were presented with The program has three levels, three practice styles and nine categories covering many areas that are important in everyday life. Have fun trying to remember things like telephone numbers, people's names, numbers, and letters. With daily use of the program, you will soon observe an improvement in memory because studying and recalling information takes practice, and Instant Memory is a step in the right direction.